The tiny town of Pomfret made world news last week. 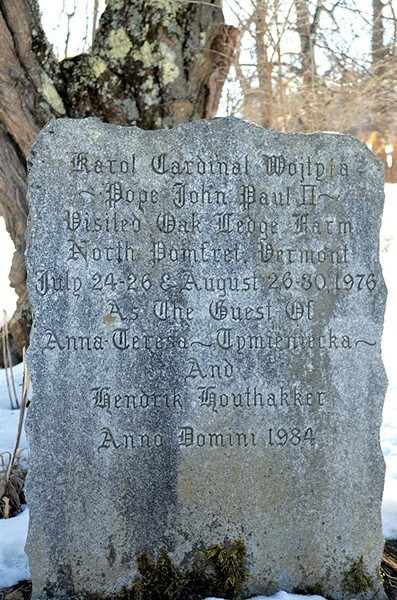 The hilly Vermont hamlet is where Cardinal Karol Wojtyla of Poland, the man who became Pope John Paul II, visited the home of Polish American philosopher Anna-Teresa Tymieniecka in 1976. The two maintained a close friendship for decades. Last week, the pope's letters to Tymieniecka were made public after a BBC reporter pried them loose from the National Library of Poland. They triggered intense speculation about the nature of the relationship between the influential, longtime Roman Catholic leader, who was canonized a saint in 2014, and the married Tymieniecka. "I am thinking about you and, in my thoughts, I come to Pomfret every day," the pope wrote her in Polish on January 26, 2002, according to the New York Times. The next year, he penned: "I often wonder what is happening — beyond the ocean — in Pomfret." The pope died in the Vatican in 2005. Tymieniecka was 91 when she died in 2014 at her family's Oak Ledge Farm in Pomfret. There's no evidence that the pope broke his vow of celibacy. Or that Catholic Tymieniecka broke the vows she made to her husband, Hendrik Houthakker, a Jewish, Dutch-born economist, who taught at Harvard for 34 years. He died in 2008. But the intense feelings the pope expressed in letters to Tymieniecka have prompted questions. So have the photographs — released along with the letters — of the fine-featured blonde and a surprisingly buff-looking cardinal posing with their skis in the mountains, relaxing on a camping trip and meeting at the Vatican. In Pomfret, the headlines are generating reminiscences about Tymieniecka, a mostly a part-time resident who served as a library trustee and once hosted the local garden tour. Various Vermont academics visited the family's modest farmhouse — which is decidedly not one of the lavishly restored horse farms in town — to drop off papers that Tymieniecka published in the many books and journals she edited as the head of a philosophical organization. She occasionally attended Our Lady of the Snows Roman Catholic Church in Woodstock, just down the road from Pomfret, although her regular church was St. Denis in Hanover, N.H., which she and Houthakker called home after he retired. 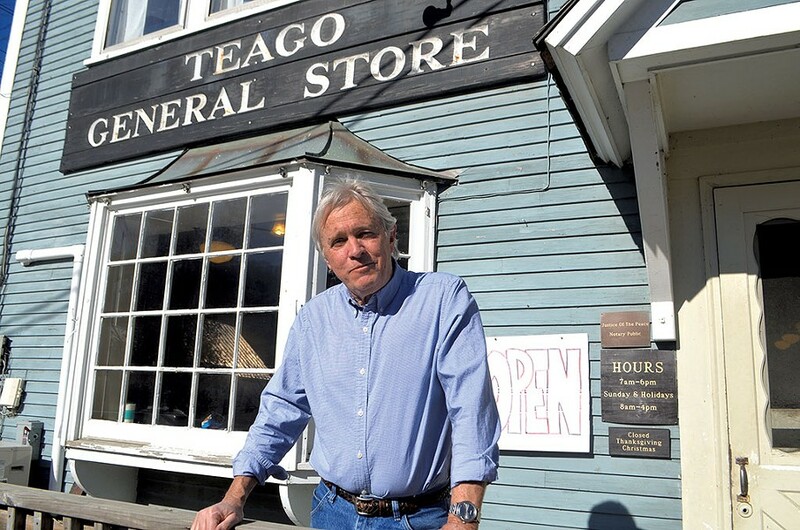 At Teago General Store, where an enormous round of cheddar awaits patrons by the front counter, owner Chuck Gundersen sells the New York Times. But he missed the February 15 story about Pomfret's papal connection. He learned about it from a vicar friend in England, who had followed the BBC reportage. Tymieniecka herself likely knew the letters she exchanged with the Holy See would one day become public. After all, she authorized Sotheby's to sell them to the library for a "seven-digit" figure in 2008, according to an Associated Press interview with the director of the National Library of Poland. Gundersen said Tymieniecka and her husband, both regulars at his store, were "intellectuals on a level so far above the experience of normal people, I don't know how to describe it. They were just in a rarefied atmosphere." She was a gracious lady, said Eleanor Pizzani, a retired nurse who showed Seven Days the way to Oak Ledge Farm. She met Tymieniecka in 2003 at a local, papal-sanctioned ceremony to honor the philosopher's husband. There's a certain irony in seeing frozen-in-time Pomfret, where the local library has a "conscience box" for borrowers to make good on their fines, being pulled into the hurly-burly of contemporary global news. When people think of stereotypical Vermont, "what they are thinking of is a place like Pomfret," noted Gundersen. "There are only 950 of us in town, one store, a tiny little ski hill, Suicide Six, and everybody knows everybody." Last Thursday, there wasn't much traffic on the roads that wind from valley to hilltop en route to Oak Ledge Farm. The Houthakkers purchased the farm as a country place several decades ago, and it remains in the family. Up a rutted road, the family's simple white farmhouse stood in a clearing. 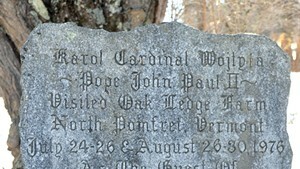 In the side yard, a granite monument marking the cardinal and future pope's visit could be seen under a bare, lichen-crusted plum tree. Across the narrow road, next to an open pasture, a layer of ice coated the pond where the cardinal once took a dip. A picnic table stood near the spot where he said an outdoor mass, reportedly after borrowing vestments from Our Lady of the Snows. A knock on the front door brought Tymieniecka's son, Louis Houthakker, to the entryway, along with two other men. Houthakker declined to comment on the letters, saying the family wanted privacy. Another man, Robert Wise, identified himself as Tymieniecka's former editorial assistant and a member of the organization she founded, now known as the World Phenomenology Institute. German philosopher Edmund Husserl is considered the father of phenomenology, which holds that human knowledge is founded on the realities presented to the senses — what people see, hear, feel and so on. Wise agreed to a short interview but would not discuss the speculation about Tymieniecka's friendship with John Paul II. "I'm not going to venture that," he said. He recalled Tymieniecka as an intellectual with tireless energy. "She was a force of nature. She virtually jumped out of bed in the morning," Wise said. In an article in the Vermont Standard in 2011, Tymieniecka explained how she met the future pope. Like him, she was born in Poland. She studied at the University of Kraków, the Sorbonne in Paris and the University of Fribourg in Switzerland, where she earned her PhD in philosophy. She emigrated to the United States in 1954 and met her future husband at a math conference. She was teaching at Berkeley; he, at Stanford. By the early 1970s they were married, and she was lecturing at St. John's University in New York. That's when she read a book by Wojtyla, then a little-known cardinal, and invited him to speak at a conference. She would go on to translate his book into English, which involved traveling to Europe, where the two talked over the project on hikes and other outdoor excursions. In the summer of 1976, the cardinal visited Pomfret twice. The first time was to prepare for a talk that Houthakker helped arrange at Harvard's summer school. The second focused on the translation, according to Wise, relaying Tymieniecka's accounts. The clergyman sang Polish folk songs, helped rake up grass clippings and gathered wood for the bonfire. "He loved Vermont. He felt comfortable here. It reminded him of the Tatra," Tymieniecka told the Standard, referring to a mountain range on the Polish border with Slovakia. According to the director of the National Library of Poland, Tomasz Makowski, the letters suggest Tymieniecka may have expressed love for the cardinal. In a letter dated September 1976, he wrote: "My dear Teresa, I have received all three letters. You write about being torn apart, but I could find no answer to these words." He went on to describe her as a "gift from God." When The Acting Person was published in 1979, some said Tymieniecka's English translation was not true to the Polish version. That the cardinal — who had since been chosen as pope — did not defend it strained their friendship. The rift healed, though, and during the next 25 years, Tymieniecka made numerous trips to Rome and corresponded frequently with the pontiff. She traveled to his side at the end of his life, according to friends and acquaintances, including University of Vermont professor of religion and philosophy Richard Sugarman. "She was there the week that he died. She had been called, presumably by someone at the Vatican, and I think she may have even seen him on his last day," Sugarman said. "That I know from her." Sugarman met Tymieniecka in 2000 when he convened a philosophy conference. She came and gave an impressive talk, without notes. "It was quite moving," recalled Sugarman, who also specializes in phenomenology. He later collaborated with Tymieniecka on various projects and came to believe she played a large role in her field. "Basically, she helped a lot of younger scholars in philosophy and also had relations with most of the prominent thinkers of her generation in Europe, in the U.S. and also around the world," Sugarman said. As to the relationship with the late pope? It was very important to her, according to Sugarman, who recalled seeing many photos of the two inside the Oak Ledge house. "She clearly had an outsized relationship with him — what kind, I cannot say. It certainly was philosophical," Sugarman said. "Of that I'm certain." As to why Tymieniecka sold the letters from the pope, Sugarman could only speculate. He suspects she thought they were of historic importance. "Who knows, she may have needed the income, too. I wouldn't be shocked by that," Sugarman continued. "As you can see from going there, the place needed work." History might never have a full answer about Tymieniecka and John Paul II's friendship. "I guess my feeling would be, Anna and John Paul and God know the nature of their relationship," said Pizzani in Pomfret, "and I don't need to know." Sugarman concurred. "I couldn't tell you," he said. "And if I could, I wouldn't."